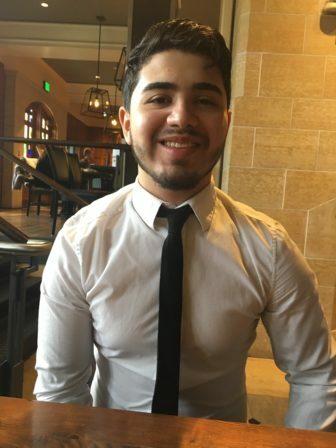 Alexis Barajas, 19, Sophomore Hospitality Business Major, Detroit, Mich. supported Hillary Clinton in the 2016 election. Click below to here from Barajas and other millennial voters. Millennials, those between 18 and 36, comprise roughly 31 percent of the voting population. According to the Pew Research Center, along with Baby Boomers (ages 52-70), Millennials are the largest voting-aged generation. The sheer number of eligible Millennials, though, belies their political influence. That’s because Millennials are the least likely to turn out to the polls. According to a Harvard Institute of Politics survey, only 23% of Millennials said they’d “definitely be voting” in the General Election. Because of their potential importance to this election, we sent more than two-dozen reporters out to interview Millennial voters on Michigan State University’s campus. Are they voting? Who are they voting for? What issues are important to them in this election? Are they hopeful for the future of the country? 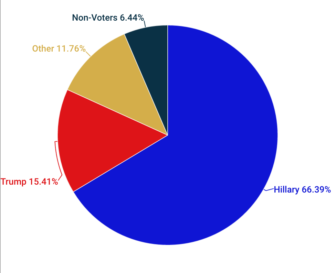 Tally of which presidential candidate the 357 voters we interviewed supported. Below you can explore the reactions to the election from these potentially pivotal voters, with a particular focus on first-time, women, and minority voters who have been especially affected by the rhetoric of this campaign. We compiled voters’ quotes based on the candidate they supported. We also talked to Millennials that are not voting, including international students. Fixation with tawdry aspects of the 2016 campaign for the U.S. presidency has made it difficult for Brazilians to understand key issues at stake, say some Brazilian watchers of U.S. politics. Issues that might be of interest to Brazil are often missing or difficult to find because some media outlets focus on negative aspects of the campaign.